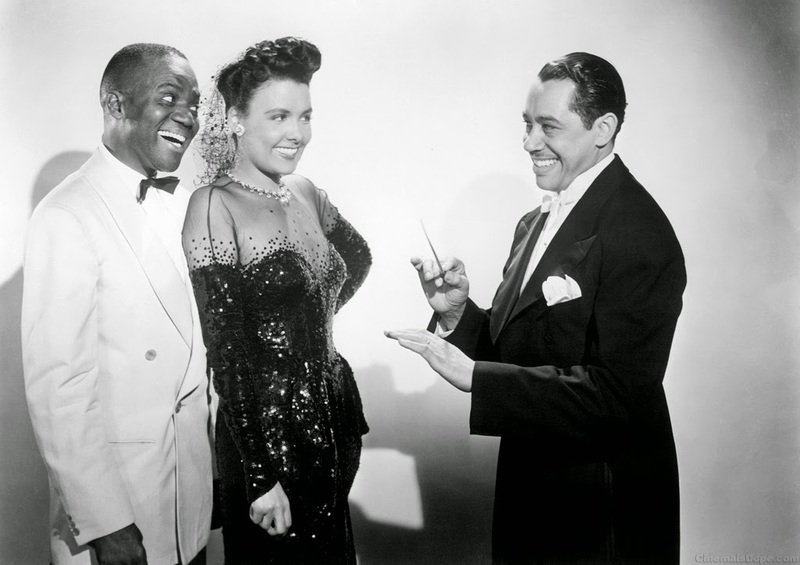 Andrew L. Stone's busy little musical for 20th Century Fox is a rare showcase for many of the great African American showbiz stars of the day, its cheery, celebratory tone and top notch songs enough to gloss over an extremely slight plot. What story there is is loosely taken from the career of Stormy Weather's star, Bill "Bojangles" Robinson, whose "educated feet" enabled him to dance his way to stardom through vaudeville to Broadway and Hollywood and is best remembered today for appearing alongside the late Shirley Temple and, unfairly, as something of a beaming Uncle Tom figure. Robinson is given the charming Lena Horne as a love interest here, she a veteran of MGM's similar venture Cabin In The Sky (1940). Her Selina Rogers gives Robinson's Bill Williamson his start in music hall after she encounters the former G.I. waiting tables in a Beale Street bar. Selina falls for Bill before relocating to Paris to further her career, only to return in time to dish up the title song (mournful and at odds with the film itself) and the anticipated reconciliation. All of which Bill accepts with the same broad grin. I suppose you can't keep a good man down. There's also some tidy support from Dooley Wilson, fresh from playing it again as Sam in Casablanca (1942), as Bill's perpetually broke army buddy Gabe, the owner of a curbside shoe shine stand who prefers to pose as a swell to impress the ladies. But rather like Frank Tashlin's later rock 'n' roll musical The Girl Can't Help It (1956), this is really an excuse to gather together a wealth of related talent to run through their greatest hits on the Big Screen. Despite the occasional cringe-inducing diversions into minstrelsy - female dancers wear golliwog-faced sunflower hats during a cakewalk, Robinson and cast dress as Zulu warriors to bang tom-tom drums in a jungle sequence - it's wonderful to have a record of stride piano hero Fats Waller mugging his way through 'Ain't Misbehavin'' (above) and likewise Cab Calloway doing his peculiar thing. The Harlamaniac-in-chief is here given more time to demonstrate his megawatt charisma and outlandish tailoring than he was in the Paramount ensemble comedy International House (1933) and makes full use of the opportunity to show off a zoot suit a lesser man would have got lost in. Both are heroes in their field, but it's the Nicholas Brothers who finally steal it. Their wild tap routine has to be seen to be believed. Like Horne, Fats and Calloway, Harold and Fayard Nicholas were seasoned veterans of Harlem's famous Cotton Club and their extraordinary athleticism and invention are immediately apparent. Fred Astaire considered this "the greatest movie musical number" he'd ever seen. Praise indeed. Astaire also famously admired Robinson and had already paid tribute to him with the 'Bojangles Of Harlem' sequence in Swing Time (1936).